Wood ear is a kind of edible fungus often used in Chinese cooking. Wood ear is black in colour, so looks not quite appealing to eyes. Yet, we can’t underestimate its value to our health. It can help lower blood pressure and cholesterol. I often use wood ear in my cooking, like Chinese New Year traditional dish, stir-fry with chicken, make the classic hot and sour soup and imitation shark fin soup. 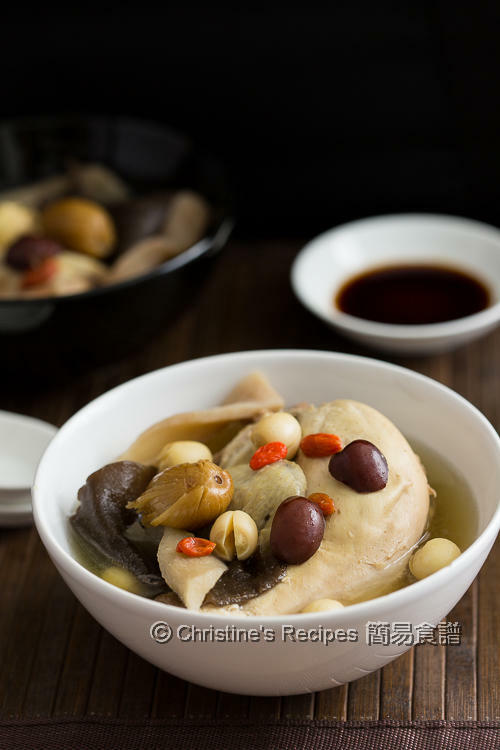 If you feel like having a vegetarian dish, wood ear will work with many vegetables. You can make this Stir Fried Bean Sprouts, Carrots & Wood Ear Fungus dish. When I make dumplings, I also like putting in some wood ear to add a texture in the fillings. Ever thought about making san choi bao (lettuce wraps) with wood ears? They taste really good with roast duck meat too. 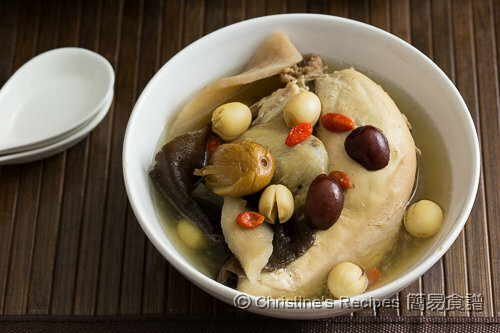 Back to this recipe, wood ear and chicken soup, it doesn’t need take too long to prepare the ingredients. You just rinse them, then put them into a large pot. Let your stove do the job for you. After 2 hours of simmering, you can enjoy a hearty and nourishing soup. It tastes absolutely delicious with a mild sweetness and helps sooth your whole body. Useful tool: Fat separator for filtering out the oil on the surface of soup. Remove the chicken skin. Blanch in boiling water to remove any blood or impurities. Cut into two to three pieces. Rinse all other ingredients. Drain well. Put them with the chicken into a large pot. Pour in water. Cook over high heat with cover. Bring it to a boil. Reduce heat to simmer for about 2 to 2 ½ hour. Season with salt. Serve hot. 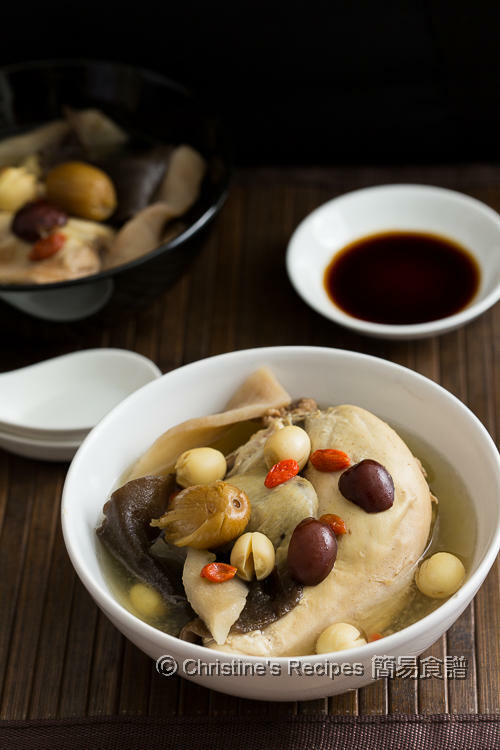 By removing the chicken skin, your soup won’t be too greasy and clear. If you want to keep the chicken skin, you might like to filter out the oil with this fat separator when serving your soup. I found this little gadget is very helpful, making your soup healthier. There are two kinds of lotus seeds, one is white and the other is red. I used the white one. Both can be used to make this soup, available at Asian grocers. Remember to check every lotus seed if their cores are removed. The cores will make your soup taste bitter. If you find any cores in the middle, you can use a toothpick or bamboo skew to poke them out after soaking in water to be softened. Very nutritious! I love all those Chinese herbs.